Russellian monism is an exciting new theory of consciousness, which promises to avoid both the problems of dualism and the problems of physicalism. Russellian Monism: Time for the Details will explore and evaluate various forms of Russellian monism. There will be seven themed sessions, each consisting either of short talks or responses to a pre-circulated paper followed by discussion. Rather than speakers giving long defences of their own views, the focus will be on getting ideas out for discussion. 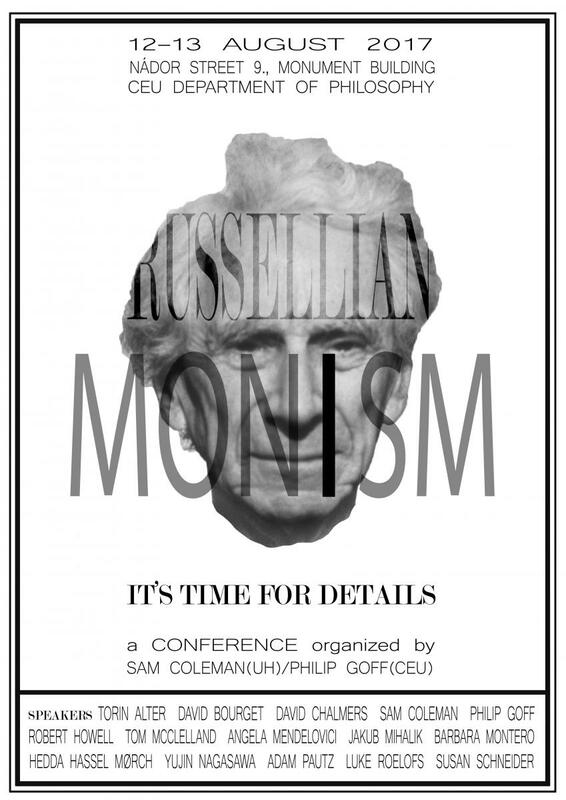 8:30-9:00: What is Russellian monism? Philip Goff explaining the essence of Russellian monism here. Simple intro to the basic idea of Russellian monism: Goff, P. (2016) 'Bertrand Russell's solution to the problem of consciousness': from Leach & Tartaglia (Eds.) Consciousness and the Great Philosophers, Routledge. Read it here. Visit the Facebook page of the conference here. The conference is funded with a grant from the Templeton funded project 'New Directions in the Philosophy of Mind. Thank you to all those who have registered. Registration is now closed as we have reached our full capacity for the conference.